Editor Damien Newton takes his son for his first ride on Metro Rail to the Expo Line’s Culver City station and everyone comes home happy. Damien writes that the Culver City opening had the right feel and that many other passengers seemed to enjoy the newly expanded system. 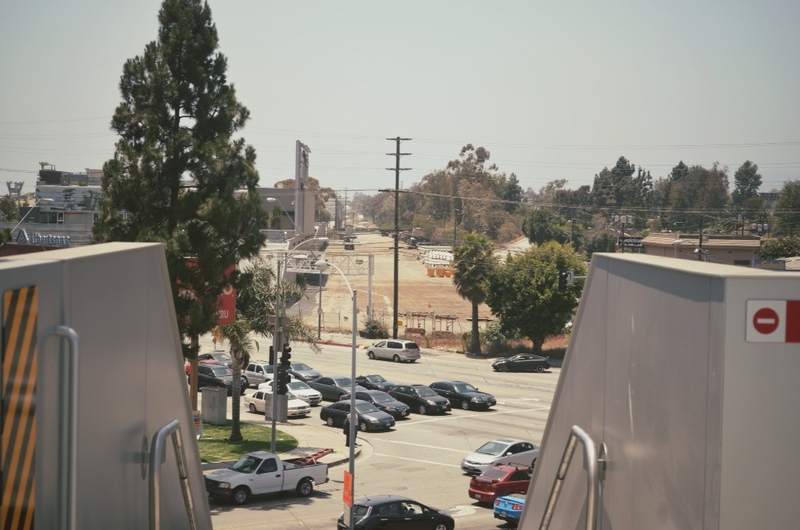 The above photo shows the view from the end of the Culver City platform looking toward Venice Boulevard and, beyond, the alignment for phase 2 of the Expo Line. The trail will cross Venice Blvd. on a bridge. A parking crunch at Logan Airport is the reason officials are spending $300,000 to provide free bus and subway rides to downtown Boston. Work begins on the first two 405-Wilshire ramps on Friday night and everyone pretty much agrees traffic in the area is going to go from bad to worse. The editorial backs Councilman Joe Buscaino’s proposal to get rid of some city of L.A. parking meters in San Pedro in order to help local businesses and promote tourism. The Daily News editorial board also hints that free parking should be provided elsewhere.